10/05/2010 – OECD countries agreed today to invite Estonia, Israel and Slovenia to become members of the Organisation, paving the way for the Organisation’s membership to grow to 34 countries. “Estonia, Israel and Slovenia, along with Chile that has just deposited its instrument to become a full member, will contribute to a more plural and open OECD that is playing an increasingly important role in the global economic architecture,” OECD Secretary-General Angel Gurría said. Angel Gurría, Secretary-General and Nicola Bonucci, Director of Legal Affairs. In statements to a meeting of the Organisation's governing Council, OECD countries expressed the wish that membership of the Organisation will bring all three future member countries closer to OECD standards in all fields. Over the years, the economies of all OECD countries have benefited in one way or another from the transformative effects of OECD membership. Sweden, for example, undertook a drive for regulatory reform inspired by OECD work during the 1990s which helped to stimulate high rates of growth amid low unemployment and stable prices. Mexico, which joined the OECD in 1994, has confirmed its commitment to an open economy based on free market trade. Korea, which joined in 1996 following three decades of rapid growth from a starting base as a rural, undeveloped society, has become a world leader in many sectors, including ICT. As part of its ongoing work to advise governments on how they might encourage innovation, the OECD will shortly publish an Innovation Strategy to provide policy makers with a comprehensive and cross-cutting policy guidance package setting out the priorities for structural reforms that can accelerate innovation-led growth. The invitation to Estonia, Israel and Slovenia to join the OECD acknowledges the efforts already made to reform their economies, including in such areas as combating corruption, protecting intellectual property rights and ensuring high standards of corporate governance, while looking forward to further reforms. All three countries will contribute to OECD work in a number of specific areas. Estonia is an acknowledged world leader in innovative e-government and e-commerce initiatives. Israel’s scientific and technological policies have produced outstanding outcomes on a world scale. Slovenia has led the way in making public sector information available to all.Other OECD countries will benefit from the unique perspectives and policy-making experiences that they can share in these areas and beyond. Estonia, Israel and Slovenia were invited to open accession talks in 2007, along with Chile and the Russian Federation. Chile became an OECD Member earlier this year and membership talks with Russia are progressing. In parallel, the OECD is strengthening its growing partnership with major emerging economies, including Brazil, China, India, Indonesia and South Africa. 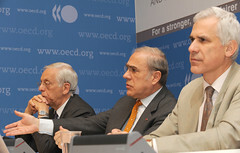 The OECD will welcome the three future members at a special ceremony during the annual meeting of the OECD Council at ministerial level on 27 May in Paris. The meeting will be chaired by Italian Prime Minister Mr. Silvio Berlusconi.